BRITTANY: I first started coming to SPIRE when I was looking for a great workout. I had been to some yoga studios in the area but needed something high energy to compliment that. From day one, I loved the energy, music and sense of community at SPIRE, that kept me feeling excited to come back. Also I loved that the workouts were tough but very do-able and you can work at your own level. After about six months of going by myself, I convinced John to go with me and he was hooked too. It became this consistent way for us to spend time together, especially when our lives get crazy. JOHN: As Brittany said, she beat me to SPIRE and came home raving about her experience in the spin classes. I work crazy hours as part of my job, finding a consistent workout is a real challenge. After working as an attorney for a few years, I had lost any semblance of a workout routine. I decided to join her for a few classes. As someone that came in with no prior experience in group fitness classes or modalities like spinning or crew, I was nervous at first. Soon after joining, I felt the community that we’ve come to appreciate at SPIRE. I was struck by how friendly everyone was – after a few classes I started to recognize the same people and felt like I was part of something by coming in. BRITTANY: Like so many people that come to SPIRE, we both have stressful jobs that require all of our time and attention 24/7. Being “on” all of the time for someone else (a patient, a client) is exhausting and we’ve come to really appreciate the time we get at SPIRE to unplug from the rest of our lives, put our phones away and sweat out whatever stress we’ve been carrying with us. It is really a release for us to be come and disconnect and really wonderful that we can get that time to unplug together. 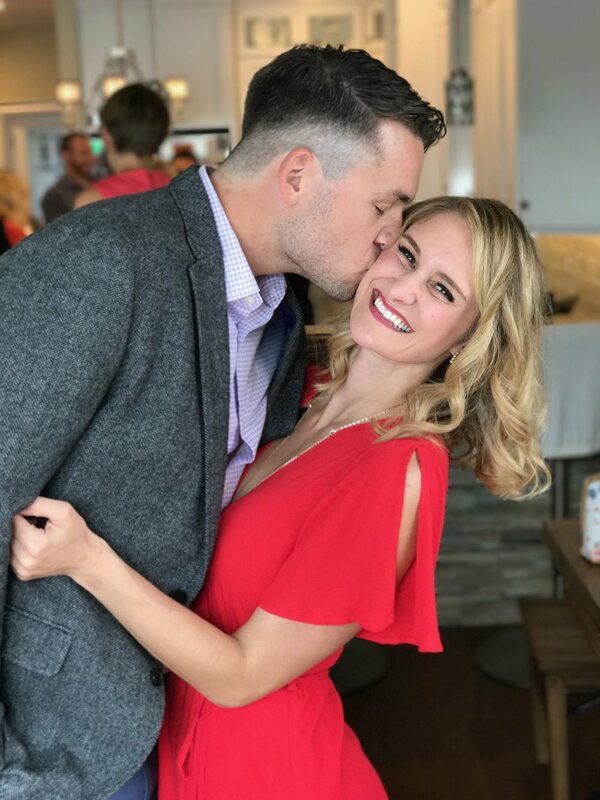 JOHN: Brittany has always been committed to staying active and working out, but as someone that can fall into bad habits, I am inspired to keep coming back to keep myself healthy and active. I just feel better in everything that I do when I’ve taken the time to exercise. We started with spin classes (Ride +, Rhythm Ride and Terrain Ride) and have ventured into Crew. We love all of our classes at SPIRE, but we most consistently find ourselves in Ride + on Friday mornings. When we aren’t working... we love to travel. John’s secret passion is planning trips and our favorite places are ones where we can be outdoors and hiking most of the time. Last year we found a way to get out to Banff, Norway, Croatia and Olympic National Park. We also work with a rescue organization and foster rescue dogs as they wait to be adopted. The organization, Fetch Wisconsin Rescue, is located in Madison and so we often are making short trips up there to pick up or meet a rescue dog or head to an event. We currently have our tenth foster dog living with us (the previous nine have all found homes with loving families! ), in addition to our two own dogs (Ernie and Lemon). Also, we both really love to eat out and are always looking for new restaurant recs. JOHN: Find a way to let go of whatever excuse is holding you back and give it a shot. See if you like it. When Brittany first asked me to come to SPIRE, I wasn’t sure what to expect and I really did not expect for it to become such a big part of my day-to-day life (I definitely didn’t expect to plan my commuting schedule around making it to my favorite classes!). I also had zero experience with a “studio” or “group fitness classes” and I really didn’t think that it was something that would resonate with me – I’d always been the type to run or lift on my own or to get exercise through sports. But, once I was able to open myself up to the idea to give it a shot, I found that I really enjoyed it and everyone at SPIRE was super willing to help me figure out how to do whatever it was I needed to (like figuring out how to clip in and out of the spin bikes!). If anyone has fears that they don’t know how to do something or to use some of the equipment, I really hope that doesn’t hold them back. Before coming to SPIRE I hadn’t used any of the equipment that is used in the studio and whenever I’m in Crew and the instructor asks us to try a move off the rower, I almost certainly am going to be doing it for the first time. This fear of something new might have kept me away from SPIRE if it wasn’t for Brittany, but that fear and nervousness was completely unfounded and once someone experiences the community at SPIRE they’ll see why they shouldn’t feel embarrassed. BRITTANY: SPIRE has definitely helped us to become morning people! Neither of us were consistently able to work out early in the morning before work prior to coming to SPIRE, but it is way easier when you actually look forward to your workout. JOHN: For me, SPIRE has helped me to find an exercise regimen that I can stick with on a consistent basis. I’m constantly traveling to Chicago for work and often work late nights and early mornings. It is easy for exercise to fall off and take a back seat to other priorities. Now, I’ve been consistently going to multiple classes per week at SPIRE for over a year and that has resulted in a much healthier version of myself than the person that walked in the door at the beginning. JOHN: This question is always tough – I wish I was more interesting and I already used our foster dogs above! I grew on a family fruit farm in northern Michigan and would have become a 6th generation fruit farmer if he hadn’t become a lawyer instead. BRITTANY: Brittany grew up figure skating and despite her modesty about it, was (and is) incredibly talented. And she has a secret talent of being able to nap anytime and anywhere. We have a routine of going to Stone Creek after working out to get coffee or lattes (sometimes you have to motivate yourself with treats!) Our other favorite is to go to the farmers market after weekend workouts and make a big leisurely breakfast with whatever is fresh that week. What is it like working out with your spouse? Are you competitive? Do you keep each other accountable? Along those same lines, we do keep each other accountable because when the alarm rings at 5 AM to get to our 5:30 spin class, it’s going to wake both of us up and if one person rolls over the other is quick to jump up and turn the light on to pull the other one out of bed. We’ve really enjoyed making an exercise regimen part of what we do together, rather than doing it separately. The format of the classes at SPIRE also let us go at our own pace – for example we can all go our own speed together on rower or a bike and still be sitting right next to each other throughout the class – Brittany isn’t leaving me behind like she might on a run or like when we actually go out cycling (very much not true). Plus, it’s really nice at the end of a class it’s nice to have someone to validate how difficult the class was. What keeps you coming back to SPIRE? We feel like we’re part of a community at SPIRE and so it makes us want to come back regularly to see the people that have become part of our weekly routine. It is hard to really explain until you experience it, but we have enjoyed making it a part of our lives. For example, we found ourselves looking forward to weekend mornings where we can go to a spin class, grab a coffee and maybe breakfast, and maybe even top it off with a walk by the lakeshore. When we’re traveling and we don’t get a chance to do that we miss it.